A United Nations University study compares for the first time the effectiveness and costs of many different technologies designed to remove arsenic from groundwater—a health threat to at least 140 million people in 50 countries. Released today by UNU's Canadian-based Institute for Water, Environment and Health, the report draws on 31 peer-reviewed, comparable research papers published between 1996 and 2018, each describing new technologies tested in laboratories and / or in field studies. 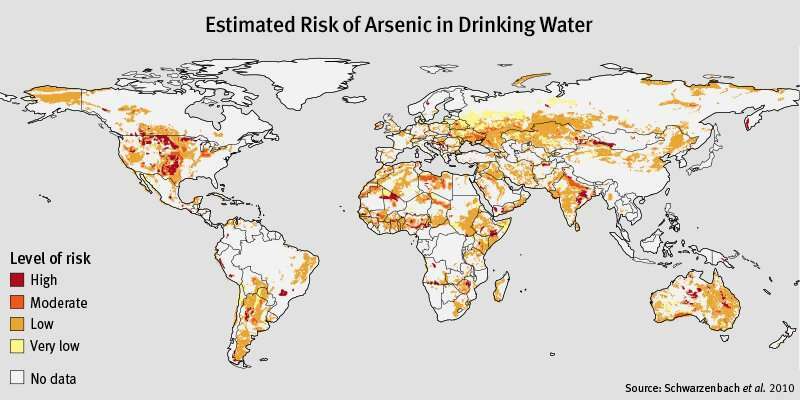 Serious health, social and economic losses are caused worldwide by arsenic-contaminated water and a wide range of technologies exists to remove it but "their widespread application remains limited," according to the report. From 2014 to 2018, over 17,400 arsenic-related publications were published and "there is a myriad of reportedly 'low-cost' technologies for treating arsenic-contaminated water. But the specific costs associated with these technologies are rarely documented," says Duminda Perera, a Senior Researcher at UNU-INWEH and report co-author. The summary of costs and effectiveness of the few dozen arsenic remediation technologies that are directly comparable in those respects can serve as a preliminary guideline for selecting the most cost-effective option, he says. It may also serve as an initial guideline (minimum standard) for summarising the results of future studies describing arsenic remediation approaches. The report notes that "arsenic-removal technology should only be seen as efficient if it can bring the water to the WHO standard" (in 2010, WHO's recommended a drinking water limit of 10 μg/L—micrograms per litre), but countries with resource constraints or certain environmental circumstances (e.g. typically high arsenic concentrations in groundwater) have much higher, easier-to-reach concentration targets. "While this may help national policymakers report better results for their national arsenic reduction efforts, it may have the opposite effect on public health," the report says. "Higher thresholds will not help solve this public health crisis. On the contrary, if a country has a feeling that the arsenic situation is coming under control, this may reduce the sense of urgency in policy circles to eradicate the problem, while the population continues to suffer from arsenic poisoning." "This policy approach is not well-conceived as it does not effectively resolve the issue." UNU studied 23 technologies independently tested in laboratory settings using groundwater from nine countries—Argentina, Bangladesh, Cambodia, China, Guatemala, India, Thailand, the United States, and Vietnam—and demonstrated efficiencies ranging from 50% to ~100%, with a majority reaching >90%. About half achieved the WHO standard of 10 μg/L. "The main objective of the report is to help accelerate the wide-scale implementation of remediation solutions to alleviate, and ultimately eradicate, the problem of arsenic-contaminated water consumption over the next decade and meet the world's Sustainable Development Goals," says UNU-INWEH Director Vladimir Smakhtin. "This report aims to inform decision-makers who face an arsenic public health challenge, of the specific costs and effectiveness of technologies tested in laboratory or field settings. It also urges researchers to present cost and effectiveness data cohesively to better inform planners' and policymakers' choice of the best arsenic remediation technologies." "Today, the current science and knowledge on arsenic remediation technologies may be mature enough to help significantly reduce the numbers of people affected by this public health problem. However, the effective translation of research evidence and laboratory-level successes into quantifiable and sustainable impacts on the ground requires a concerted and sustained effort from policymakers, engineers, healthcare providers, donors, and community leaders."